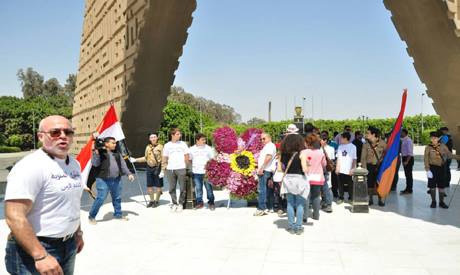 Dozens from Egypt's Armenian community gathered on Friday at Cairo's Unknown Soldier Memorial to commemorate a hundred years since the mass killing of Armenians by Ottoman Turks. 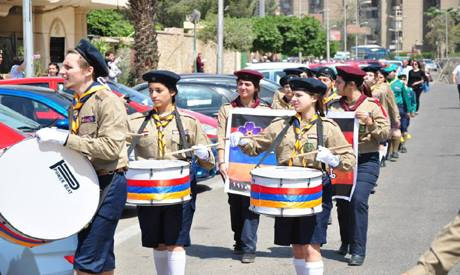 Boy and girl scouts from Egypt's Armenian Orthodox Church walked to the monument holding Egyptian and Armenian flags, as well as banners in Arabic in remembrance of the victims of the first genocide of the twentieth century, in which an estimated 1.5 million Armenians were killed by Ottoman forces. 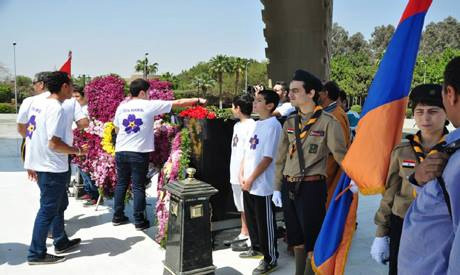 Following the killings of 1915, thousands of Armenians arrived in Egypt as refugees, swelling the ranks of an Armenian community already long present in the country, especially since the early 19th century under Mohamed Ali. 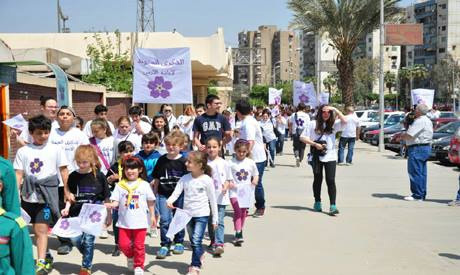 On Thursday, the Armenian Orthodox Church in downtown Cairo held a special service to commemorate the genocide, during which the church bells rang 100 times to mark the anniversary at 5:15 PM, just like all other Armenian churches across the world, except in Turkey. 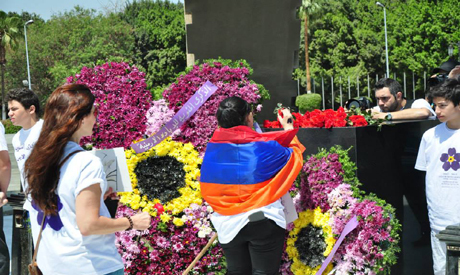 While world leaders including the Russian and French presidents attended the official commemoration of the genocide in the Armenian capital Yerevan on Friday, neither Egyptian president Abdel Fattah El-Sisi, who had been invited, nor Egypt’s ambassador to Yerevan Alaa El-Lithy Nassef attended, according to the Egyptian press. 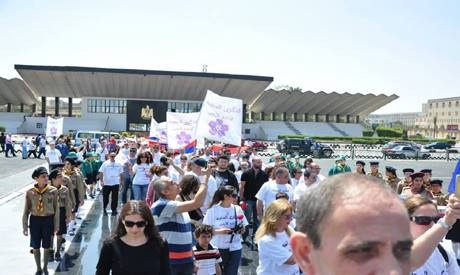 The head of Egypt's Coptic Church Pope Tawadros II, members of Egypt's Armenian community and 115 Egyptian journalists travelled to Armenia instead. Pope Tawadros II told the press that his visit was purely out of support from one church to another and without political motive. 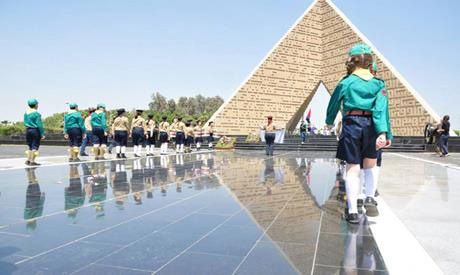 Officially, Egypt has not yet recognised the Armenian Genocide, but its government did however recently condemn Turkey's long-standing refusal to admit to its crimes against the Armenian people. Relations between Cairo and Ankara have soured since the ouster of former Muslim Brotherhood president Mohamed Morsi, who was a close ally of Turkey's Islamist president Recep Tayyip Erdogan. The Turkish leader has insisted that the ouster of the democratically-elected Islamist president in July 2013 amounted to a military coup. Doesn't their life value same as Armenians ? Under wester incitement, Armenian yout started Turks in Anatolia for the purpose of creating greater Armenia. Besides millions of Muslims were killed at the hands of Christian powers, including Russia, Grece, and Balkan states. This is exactly the line they teach in today's turkish high school books. During the pre-genocide era, armenians were forced into second class citizenships and it is documented they killed turks...all 120 of them !!!!!!!. this was not religious but social. It is the first time I hear of millions of moslems being killed; maybe its a "new" history or maybe you have no idea about history. I REMEMBER & DEMAND.